Savji Dholakia, the Surat-based diamond merchant has gifted three Mercedes-Benz GLS SUVs worth Rs 3 crore to senior three staffers who completed 25 years at the company. Savji Dholakia, the owner of Hare Krishna Exporters has done it again. The Surat-based diamond merchant has gifted three Mercedes-Benz GLS SUVs worth Rs 3 crore to senior three staffers who completed 25 years at the company. 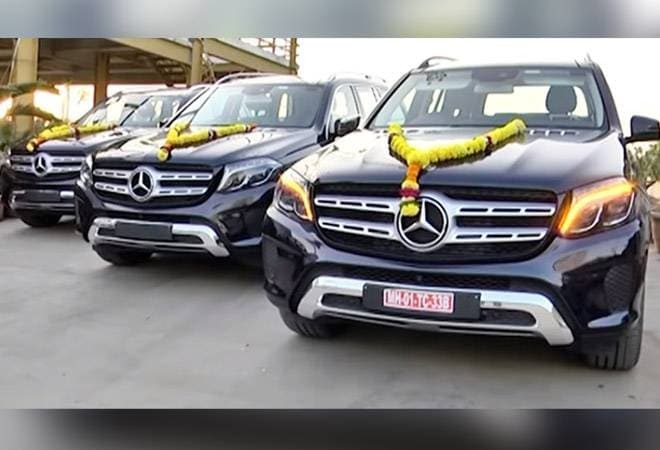 The luxury SUVs were gifted to employees at a ceremony in Surat. The on-road price of a Mercedes-Benz GLS 350d SUV in Surat is currently around Rs 1 crore. Nilesh Jada (40), Mukesh Chandpara (38) and Mahesh Chandpara (43), who had joined the company in their early teens and now look after key departments of management, cleaving and manufacturer, respectively received the gifts. The car keys were handed over to them by Madhya Pradesh governor and former Gujarat CM Anandiben Patel. The Gujarat-based businessman had earlier gifted Datsun redi-GO cars to more than 1200 employees. "These three had joined us when they were just around 13 or or 15 years old. They started with learning to cut diamonds and polish it and now they are not only experts but most senior and one of the most trusted people of our company," Dholakia told TOI. Hare Krishna Exporters employs more than 5500 people. The company makes a annual turnover of Rs 6,000 crore.